Quicke Q-series shows how clever engineering makes all the difference. These front loaders come with outstanding visibility, optimized work angles, and smooth and easy implement changes. Back all that up with the intelligence of Q-companion, and you just won’t find a more high-functioning, usable front loader. Our centrally-placed valve has many advantages. It gives the loader exact control and optimal force for heavy-duty tasks. 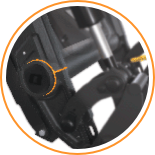 The location of the valve gives optimal vision for the driver and offers outstanding durability, as all the components are being protected by a durable polymer cover. Smart details makes the Q-series easy to keep clean. 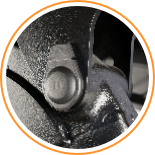 Every pivot pin has a cover that ensures the lubricating grease is contained when for instance pressure washing, keeping the loader and tractor clean. 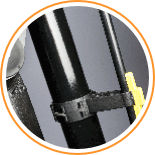 Our well proven connect and disconnect system Lock & Go® will save you time without having to compromise on safety. There are no loose parts and no tools are required. You simply connect and disconnect the loader with minimum possible effort. The compact implement angle indicator is easily adjusted for different implements and offer settings for 3 different implements at the same time. Use it for easy implement angle reference relative to the ground. 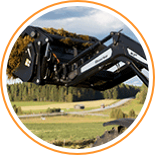 The hydraulic system has been substantially improved and boasts around half of the pressure drop compared to our previous loader range. The result is quick and excellent response, less heat buildup and a small, but still, saving on fuel. It also allows for a class-leading SoftDrive load dampening. 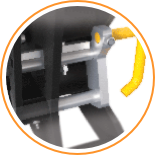 Mechanical self-levelling is a safe and convenient option. 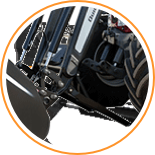 Our Q-link makes it all happen and is also a design feature incorporating curving and chamfering to follow the tractor bonnet design. As an added bonus it also helps to raise the lift capacity of the loader! Loaders with manual implement lock comes with our clever and safe Clic-on function that ensures reliable implement locking – every time. Use the classic handle or the side mounted handle at your discretion. 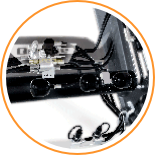 Loaders with Q-lock, our hydraulic implement locking, uses the side handle as lock/unlock indicator. We’ve added cast and forged parts to the highest stressed areas of the loader arm; rear pivot, knee and front part. An optimized use of material gives the loader outstanding durability, but not at the price of excessive weight. Enjoy the loaders maximum performance years to come! 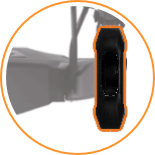 The loader arm is chamfered on top and bottom to give optimum visibility and strength. The embossed sides makes it look smart and also increases stiffness. The low placed cross tube offers maximum, unobstructed visibility. 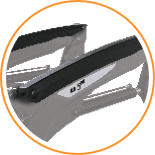 It’s welded to the heavy duty, cast front part and additional reinforcements forms a rock solid connection to the loader arm. The bearing box has a compact design and is profile-pressed to allow for a short locking pin, but a wide top for maximum loader stability. 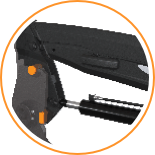 The loader pivot is very close to the subframe U-support for optimal load transfer. The proven Delta style subframe has precision machined surfaces towards the loader bearing box. The wide U-support at the top, combined with the over-sized locking pin forms a solid connection. After several hundred thousand sold units we can safely call it a proven design. 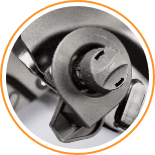 All pins are galvanized and fitted with Quickes proven torque tab lock. The pivot pin between cast link and tilt cylinder is subject to very high loads and has a new designed torque lock as well as 3 grease points. 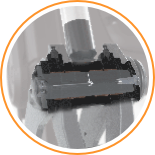 Axial play is prevented by the inner rubber-steel washer which also helps keeping the grease inside the bearing. Fully integrated heavy-duty design with flexible positions makes it quick and easy to connect and disconnect your Quicke loader. No tools are required and there are no loose parts. 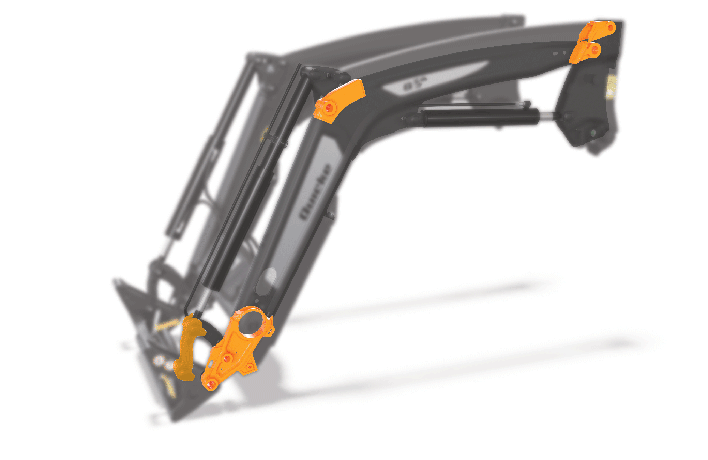 The new Quicke Q-series is engineered for modern farming. Through innovative, forward-thinking design, we’ve developed smart solutions that put you one step ahead. We’ve built a loader for today that is ready for tomorrow. You expect your TV, your phone, and your car to be smart – why expect less from your front loader? Every detail of the Q-series is the result of seven decades of experience, our obsession with detail, and a commitment to build the equipment you need to shape the future of farming. Q-series front loaders will improve every aspect of your work, and help you finish every work day with the rewarding feeling of getting things done. Strength, versatility, superior quality, and attention to detail. These are the hallmarks of the Q-series. This is the front loader that will endure any challenge you throw at it. With ingenious design and precise engineering, we have increased its life span immensely, compared to both its predecessors or to any competitor. Farming is the toughest work there is, but Q-series front loaders are in it for the long run. 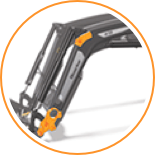 With cast and forged components in the rear arms, knees, and front parts, the Q-series has superior strength and durability. And the unique twin U-beam structure not only gives outstanding strength, it also allows for exceptionally high-visibility operation. The unrivalled arm strength and stability of the Q-series means you get the confidence of a tough, durable loader that will see you through many seasons of hard work. And if we left it there, that would make it one of the best pieces of equipment on the market. But that’s not good enough for us. So we also set out to make our loaders strong and smart. 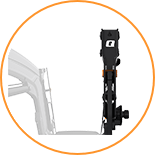 With Q-companion, the Q-series offers simply the best, most capable, most efficient tools on the market. They get the work done. Fast. Precise. Reliable. And super efficient. These are loaders for the farmers of today, and tomorrow.